Each 35g scoop packed with 27.6g fresh and pure whey protein. The highest protein per scoop. Unflavoured raw whey protein without any addition or fillers. 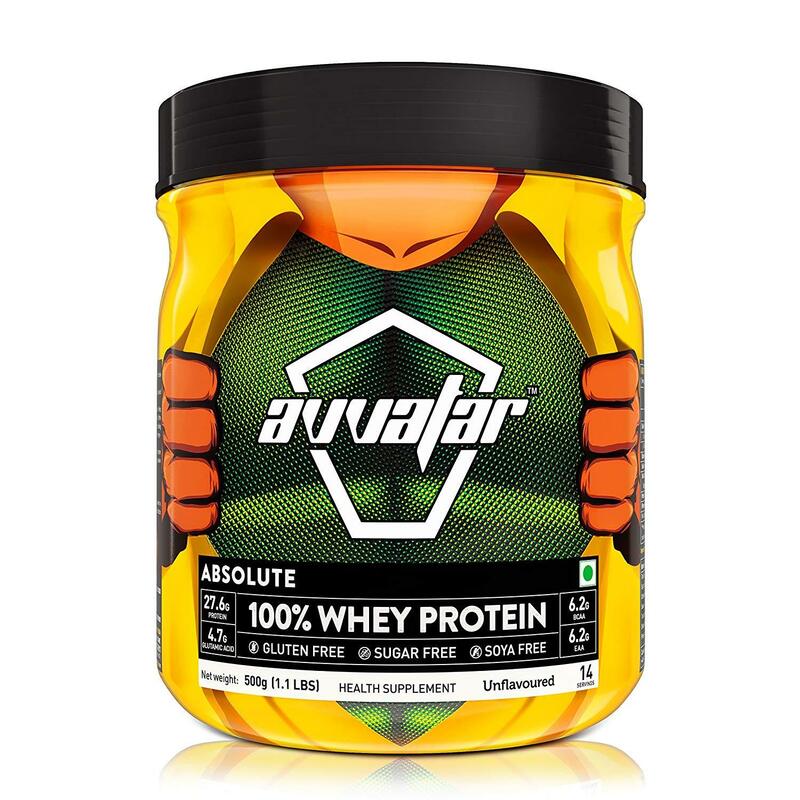 Avvatar Absolute 100% Whey Protein is packed with 24g protein per scoop. The primary source is whey protein concentrate which is loaded with health boosting natural bioactive compounds along with phospholipids for quick recovery and sustained results. 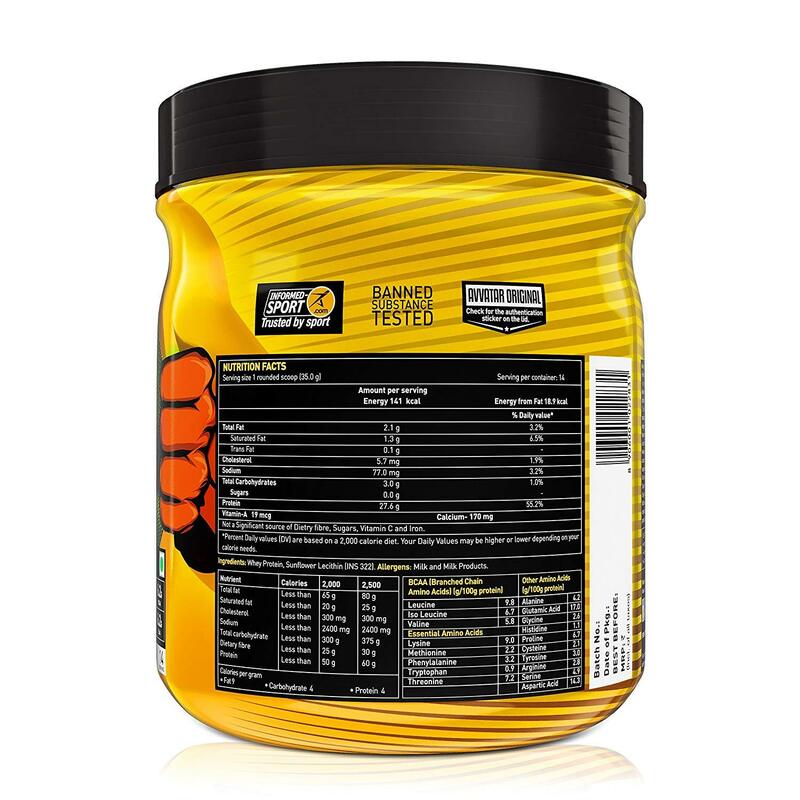 It is loaded with 7.8g BCAA and 7.9g EAA for lean muscle growth and faster recovery, 4.9g Glutamic Acid enables proper functioning of the muscle cells, minus the sugar, gluten, and soy. Avvatar is the purest whey you’ll ever consume. It’s the freshest you’ll ever get. Milked, processed and packed within 24 hours. It is 100% Vegetarian, Made from fresh grass fed cow’s milk and manufactured with multiple stringent quality tests. It’s time you add more firepower to your nutrition stack. It’s time you take your game to the next level. It’s time you #ReconstructYourself. A perfect product for Gym goers, Bodybuilders, Cross-Fit athletes, Endurance runners, and fitness freaks. Whey Protein, Alkalized Cocoa Powder, iodized salt, Acesulfame potassium (INS 950), Stabilizer (INS 415, INS 417), Sunflower Lecithin (INS 322). Add one provided scoop (35g) to a glass or shaker filled with water or your favourite beverage (200ml) and mix for a few seconds until the powder is completely dissolved. Avvater absolute 100% WHEY PROTEIN is instantized, making it easy to dissolve in any liquid. adjust the taste of your avvatar absolute 100% whey protein by varying the amount of liquid that you use to prepare it.